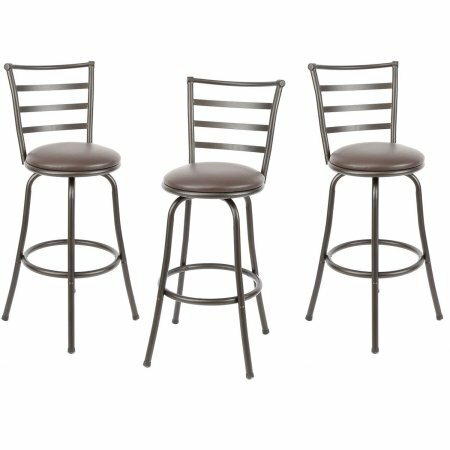 The Mainstays Adjustable-Height Swivel Barstool, Hammered Bronze Finish, Set of 3, Multiple Colors has a sturdy metal frame, a ladder back design, and a convenient circular footrest to enhance your comfort. It also features a 360-degree swivel enabling you and guests to turn in any direction effortlessly. You can choose from vinyl espresso or tan microfiber seat cushions. The Mainstays Adjustable-Height Swivel Barstool comes with interchangeable legs that allow for 24 and 29-inch seat heights depending on your needs. This transitional style with ladder-back design fits seamlessly into nearly any decor. It is ideal for use at a breakfast bar, kitchen island, home bar, or counter-height table. This padded barstool comes with tools and all necessary hardware for a quick and easy assembly. Dimensions: 15.74" x 18.9" x 36.53" - 40.94"